This blog article is the third and final part of the Ultimate Guide to Using LinkedIn to Find New Clients. This 3000+ word guide will help you use LinkedIn to find new clients, connect with them, and generate leads to grow your web design business. Optimized your profile? Found and connected with an audience? Then it is time to join the top 1% of LinkedIn superstars! Lurkers:The large majority of users on LinkedIn - so chances are you're a lurker. Lurkers don't post, share or comment. They just browse through their news feed. Contributors: This group contributes actively. They comment on posts and share them. They post articles they've read. Creators: This is the smallest, but most interesting group. It's the 1% of LinkedIn. This tiny group of LinkedIn superstars actively creates and writes new content on LinkedIn. They have a large amount of followers and are considered thought leaders. Do you want to create, contribute or lurk? An “easy” way to stand out is to be a creator. I used to only occasionally post some travel pics or anniversaries on Facebook. Then when I started working with social media, I hid behind the organisation I was working for and posted only very impersonal stuff. With this personal angle, it was a very relatable way to learn, and I felt like I knew the people who were sharing info about their professional lives. Building trust is crucial to achieving anything - and I saw how powerful LinkedIn could be. So I started wondering if I could also share what I learned in my day job as a freelancer. I decided to do a 30 day experiment, posting daily to see what works to spark discussions, build trust, showcase achievements, sell… By calling it an experiment I also welcomed failure as a way to learn. This worked so well I continued! Meet new, interesting people from all over the world - one of my favourites is Dave Grow, COO of Lucidchart. He posts great stuff on leadership and company culture. Sell event tickets - notifying my network what I’m doing sometimes results in people buying tickets - and also invites new projects. New clients and projects - I showcased what I was doing for one client and got contacted by another one interested in my services. Feedback - I posted an article about an event I hosted recently and asked what the attendees liked the most. Trusted recommendations for tried and tested products, potential partners and suppliers - I often ask for speakers for my events. Share an interesting statistic - all kinds of infographics work really well! I sometimes look for infographics on Twitter #infographic and pick out something I find interesting and that is popular. Just remember to always cite the source! Tip: The ideal image size for LinkedIn is 552x828 pixels. You can easily adapt an image to the right size for free using the picture editing tool Canva. “Can we skip the speakers at events?” is one of my top performing posts. Answer questions that your customers always have. "Will my website rank high on Google?" Post regularly, once or twice a month, once bi-weekly, weekly, once a day… it depends on your ambitions. More on how to find the time later. Answer all the comments you get on your posts - the more comments the more LinkedIn sees this as content they are willing to share across LinkedIn users, the more visibility you get. If you need customers and want to grow your business you should make time for LinkedIn. The bare minimum you should do is optimise your profile. This can be done in an hour or two and stays with your forever. A good idea to get started, is to do a challenge of daily posts, e.g. even for just a week. Announce it and do it together with someone else you know. This will force you to train how to write content. The more you do it the easier it gets. The hard part is starting. Afterwards, you can post less, but as with most things in life, the more effort you put in, the more benefits you’ll reap. Some people block time in their calendar for LinkedIn. I do it more on an impulse. I have LinkedIn open in my browser all the time and usually post something just before or after lunch time. Most of the time I don’t plan my posts, I post about work-related things based on something I am thinking a lot about, doing or that I feel strongly about. This makes the content more authentic and relatable. Good luck! I hope I’ve inspired you to be more active on LinkedIn and showed you how. 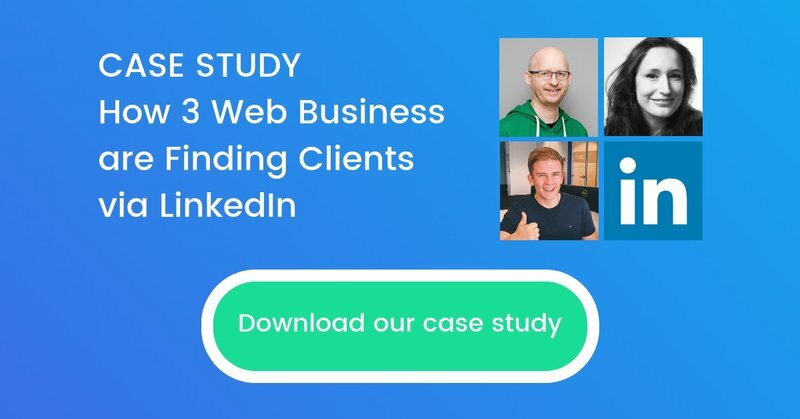 If you have any questions you can connect with me on LinkedIn or watch the recording of my webinar on this topic, explaining you how to use LinkedIn to find new clients for your web design agency.